This month has been less than stellar. It’s already the 9th and I’ve had two good days of writing, and couple days of no writing. I think I know what’s causing it, or rather aggravating it at the moment. I’m under a great deal of stress from the rest of my life. This has put me in a kind of funk, and I hate it. I admit I’m prone to depression sometimes, and I’m not quite at that stage at the moment, but sometimes it does look a little bleak to my messed up brain chemistry. I can’t tell anyone why that stress is (yet) but I can tell you I am taking measures to alleviate it. The solution isn’t an easy one, and it took me months to finally decide to do it, but my close friends who know about the situation agree that it is the best thing for me right now, and are being very supportive in the situation. I will let all of you know what happened, and what my choice to fix it was, as soon as things are fixed. It means I’m not writing as much as I’d like to, or need to, in order to finish the novels I had planned on time. NaNoWriMo is coming up soon and I was planning on writing a stand alone novel, “Awaken the Dragon”, but I don’t want to do that unless my Witch’s Trilogy is finished and on to the editor. As it is I am 50,000 words into a 80,000 word novel. 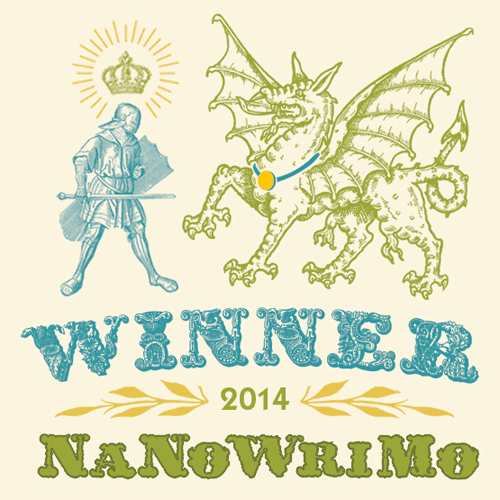 I think I might end up using NaNoWriMo as a boost to get it finished. After NaNoWriMo I planned to start working on my urban fantasy series, Eternal Tapestry, about goddesses in the modern day world. I still plan to do that. I have five novels already outlined for it, and some of them already have several thousand words of beats and chapters written. For 2016 I want to get at least four of them out. They are shorter novels, but fun to write, and not quite as difficult as the Witch’s trilogy has proven to be. On other news I am moving all of my books (short stories and novels) off of other platforms and going strictly KDP. This means that you can get (almost) ALL of my books through Kindle Unlimited. It also means there will be several books coming up for free. I had been holding out on the Witch’s books since I wanted to put the first perma free once I got the third one done but it’s not doing anything while I wait for that to happen. Better to try KDP for a few months and see what happens. I’ll try to have one free story every other weekend for a while. We’ll start with that and see what happens. Also, if you haven’t seen my youtube channel yet here is a good opportunity. I decided to participate in Booktube more. It was an easy choice since I love to read, and I’m passionate about books. It’s also loads of fun. Who doesn’t like to talk about things they love? If you’d like to see some of the episodes you can check that out here. There will still be the occasional vlog from Gregg and I, and there will also be Loot Crate unboxings, and other little things. But mostly it’s going to be about books I love to read and I think others will like too. I would love to see you guys in the comments. Tell me what books you love, or which characters you hated. I’m also going to try… TRY… to be better about sending out newsletters. I’m terrible with it and I know, but I do want this to be a useful thing, not just sending notes in bottles so I feel like I need something to say, and with my publishing schedule I don’t have a lot to say very often. To that end: do you have any questions? Concerns? Gripes? Let me know. It will give me something to talk about in the next newsletter. I wrote about my strategy to pay attention to my bodies desires and write for a bit, get up and move around, then write some more. It was a fantastic plan, and I’ve been doing it regularly. The trouble is that things get in the way sometimes. I still have to write, of course, but those things make following my bodies natural rhythms difficult. I haven’t been getting much. Plain and simple, I just am not right now. Part of this is that my boyfriend moved in, and our work schedules do not synced up very well. I tend to like writing at night after the house has settle down, usually from 10pm to 1am. He wakes up at 5:30am. This throws my sleep scheduled off a lot since I have difficulty going back to sleep afterward. It’s okay for a while, but I’ve been finding myself taking naps after work lately just to make it through the night. The nice part is that his schedule will change soon and hopefully I’ll be getting more sleep. Worse? Both of us have been working massive amounts of overtime at our respective jobs. This has left me less down time to just relax and have time to myself, especially since the one day a week I have off is devoted to dentist appointments, shopping, and other necessities of living. I’m tired. I’m writing anyway. A while ago I wrote about my daughter coming home and having to go pick her up from the bus. This was a huge sap on my writing schedule and I have been struggling to catch up ever since. I’ve written 2000 words on a lot of those days since then, but with the lack of sleep, and a few other things going on I just haven’t caught up. I’m currently 4k behind and it’s looking like I’m going to stay hovering at 3-4k behind till the very last day. NaNoWriMo, for me, is a learning experience each year. This year I’ve learned that writing 1500 words a day isn’t difficult, and I’m hoping to stay at that level even after NaNoWriMo is over. What really is amazing to me is that over the last twenty two days I’ve had four days of less then 1000 words. FOUR DAYS! That’s kind of amazing for me. And on those days I still wrote almost 500 words most days. That is extremely different for me and incredible in and of itself. 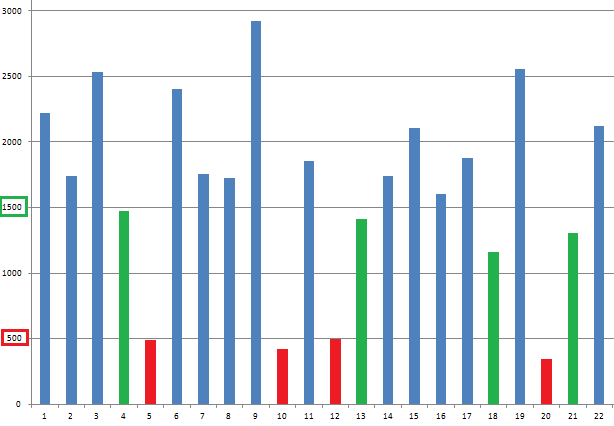 Before this month my average for writing was 3-500 words. That’s it. Some days less, some days more, but never enough to make me feel like writing could be a full time career. A writer needs to do one thing above all others: write. If you aren’t writing then how can you make a living writing? Does a swimmer swim? Does a musician play an instrument? If they aren’t doing that thing then how do they make the money? So the fact that my writing has increased steadily, and that I now feel comfortable, almost elated to have so many words a day, is fantastic. I know that when I switch over to doing edits that word count is going to drop, but hopefully I can work on a project in the evenings and edit in the mornings. I’m not quite sure about that one yet, but I’ll have a perfect opportunity to find out after NaNoWriMo, and book three of my trilogy is complete. No you can not write! We make plans. 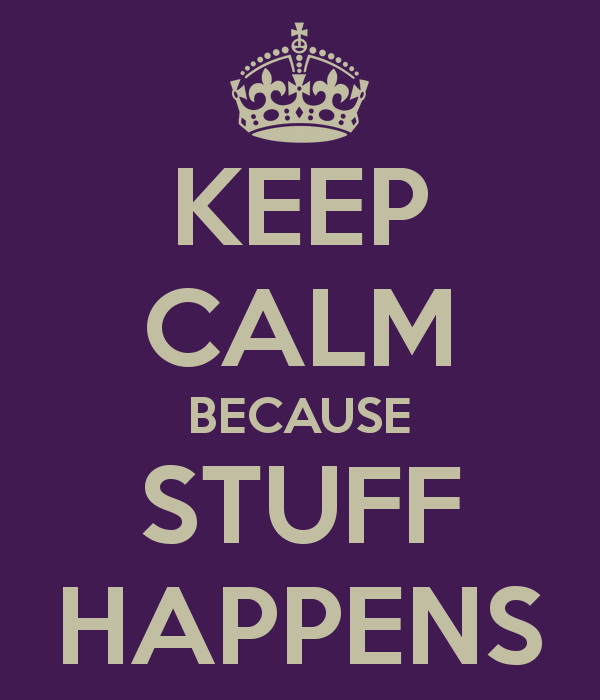 Then something happens. That’s life. Last night I got a surprise call from my daughter. “I’m coming home mom. They shut down school because of a big blizzard coming through and sent us home. Come pick me up at the bus station”… at 10 pm. Bus was an hour late late. Drive was 45 min each way. I did manage to write 500 words yesterday, but as of this moment I am 3866 words behind. That’s 15.5 pages. Can I write that much in a day? Probably not. I’ve got things to do today. But I will be working really hard over the next few days to catch back up to the daily goal so that I don’t have to write 10k words in one day at the end of NaNoWriMo. So what did we learn? If you’ve got to sit at the bus station waiting for your daughter for an hour maybe you should bring a way to write for a little bit, even if it’s on your phone. I wasn’t prepared to do that. Also, stuff happens. No matter how much you plan, how well things are going, stuff is going to come up. It’s going to side track you and throw you off. But you just keep plowing threw. Maybe it’s just that I love that my attitude toward writing has shifted so much, and that I finally, FINALLY, feel like I can do this. 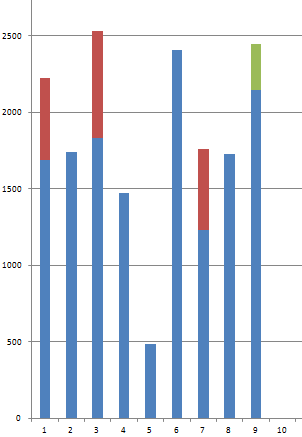 So here is my data for the month so far. Notice day five with the almost 500 words. I was exhausted that day with lots of things going on, and at about 1am just decided sleep was better then forcing myself to keep going. So I went to bed. And the very next day I wrote almost 2500 words. But the really awesome part? Day five when I was exhausted, mentally and emotionally, and I just didn’t want to look at the computer any more let alone keep my eyes open… My worst day this month so far was better then my best day most of the rest of the year. For the last year I had been trying to get my daily word count to 500-1000. It ended up being between 300 and 500. But now? This month? It’s 1600 and holding strong. In fact if you get rid of that one 500 word day my daily average is 1800 words. And I am loving it! I think two things have really helped me change. First of all, I read 2k to 10k last month. While I had heard her talk about many of the things that helped her get to 10k words a day, for some reason reading it made a couple things click. A big thing was the plotting. When you get stuck take out some paper (or in my case I just switch to red text on the PC) and jot down notes of what you want to happen in that chapter. I’ve been doing a lot more of that. But she also talked about having fun with your writing. Enjoying it. After all, if you find it boring and tedious so is your reader. The second was an interview with Dean Wesly Smith on Rocking Self Publishing. He kept going on about how much he loved writing, and how it wasn’t work, it was play. Then he said one summer he had to dig ditches on a golf course in the blistering heat. That was work. Making up worlds isn’t work, digging ditches is. I’ve dug ditches before. I fed farm animals, plowed fields, mucked out horse stalls, and everything else you can think of on a farm. I’ve changed lots of dirty diapers, and wiped the snot off little kids noses for years on end. That was work. All of that was work. Writing? It’s fun. It’s still a lot of time and effort, but it’s fun effort. And it’s worth it. I love it. That change in attitude right there is really what got my word count up. And I think I’ll keep it come next month and the end of NaNoWriMo.